Weighing roughly 350 grams (12.5 ounces), the aptly named Tour 350s are the lightest rigid-frame crampons on the market. With 8 sole points and 2 curved toe points made of aircraft grade aluminum, the CAMP coltelli (lit. "knives" in Italian) provide much needed security when booting up steep, icy couloirs. The Tour 350 is an automatic crampon, meaning it's designed to snap easily onto A/T, tele, or rigid mountaineering boots. Combine the light weight, impressive packability, and ease of donning, and you just might end up bringing these on every trip into the mountains. 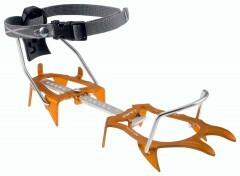 Compact 10 point crampons pack down small and clamp securely to ski boots with an automatic heel bail. Constructed with an 7075-T6 aluminum alloy to give good strength at a low weight. Anti-balling plates included that help prevent dangerous snow buildup on the soles of your boots (39g/foot). 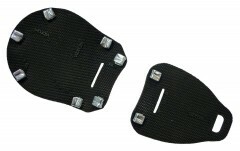 Rigid frame connecting the toe and heel piece is easily adjustable to the length of your boots. Comes with a handy 21 gram wrench for making quick adjustments in the field. Updated anti-balling plates (+45g per side) come installed. ** Please note that CAMP recommends the Tour 350 crampons only for boots up to size US 10.5, though race boots can go a little higher. For larger feet, they recommend the XLC 390. Also please remember that aluminum crampons are not designed for climbing water ice. Hey Bert! Listed weight on our website is without the anti-balling plates. The link you provided is the newest anti-balling plate and they weighed it with those installed. Our verified weight with the anti balling plates installed is 224g per side. Overall: Five Stars for the second-lightest option among CAMP’s four different aluminum crampon models. The bite of the Tour 350 is a bit compromised compared to a 12-point crampon – see my reviews of the slightly heavier XLC 390 and the steel-insert XLC Nanotech. But the attachment system is still traditional – see my review by contrast of the Race 290. This brief review focuses only on what distinguishes the Tour 350 from the XLC 390, so see my review of that “baseline” model for more details on the common features. The Tour 350 saves a small amount of weight compared to the baseline XLC 390. The trade-off is two fewer points on each toe section. Climbing purchase has always been sufficient for me, but the bite of the 10 points is slightly yet sometimes noticeably compromised compared to the 12 points on the XLC 390 (or the steel-insert XLC Nanotech). Personally, with my climbing conditions and comfort level, I’ve been fine with the CAMP 10-point design. But if you’re suspicious of the climbing ability of aluminum crampons, or doubtful of your own climbing abilities, or really want to push the limits of aluminum crampons, then consider instead the 12-point XLC 390 (or steel-insert XLC Nanotech). I have a pair of Race 290, which is similar to Tour 350 except the bindings, I believe. For what these crampons are intended for (non technical hard snow), 10 points are sufficient for me. I have used 12 points crampons on some of the same terrain and I can't really tell the difference. Sure, when it gets technical, you want steel crampons.